The current minimum landing sizes of fish and shellfish within the North Western Inshore Fisheries and Conservation Authority district. The sizes apply both at sea and on the shoreline, for both commercial and recreational use. Any fish or shellfish below this size must be immediately returned to the sea. Please note that there are two sets of additional minimum sizes; one that applies in the former North Western Sea Fisheries Committee district and one that applies in the former Cumbria Sea Fisheries Committee District. 1st February and 31st March 2019 (inclusive). Between 1st April 2019 and 31st October 2019 (inclusive) recreational anglers may retain one European seabass (over 42cm) per fisher per day. Full guidance can be found on the MMO website. These sizes apply throughout our district. 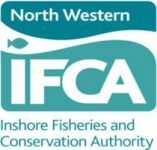 Please note that additional size byelaws apply depending on whether you are in the former North Western Sea Fisheries Committee district or the former Cumbria Sea Fisheries Committee District; these can be found below these tables. These sizes apply between the Welsh border in the Dee Estuary to Haverigg Point in Cumbria. These sizes apply from Haverigg Point in Cumbria to the Scottish border in the Solway Firth.